The Uptown Oakland spot’s ‘Burgs’ and ‘Nugs’ manage to be revolutionary without being sanctimonious. Instead of fries and soda, LocoL serves agua. Hours: Daily 8 a.m.–8 p.m.
How do you review a restaurant whose stated goal, quite literally, is to change the world? That's the bar that Roy Choi (of the Los Angeles-based Kogi food truck empire) and Daniel Patterson (Coi, Haven) set for themselves when they first announced plans for their fast food collaboration. 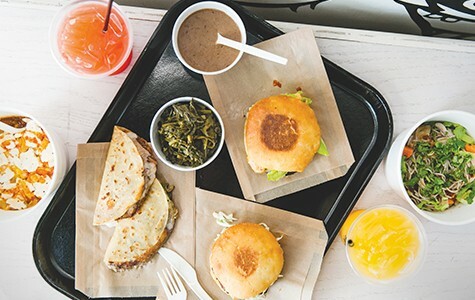 LocoL, a chef-run fast food restaurant, would bring unpretentious, affordable eats to the food deserts and swamps of America — to, in Choi's words, "upend the fast-food industry" by battling the McDonald's and Taco Bells of the world on their home turf. The idea wasn't just for these star chefs to come down from their ivory towers to start selling stuff to the "common people" — like Wolfgang Puck starting a line of frozen dinners or opening an airport kiosk, or whatever. Instead, the goal was to impact the health of the millions of Americans who are addicted to Big Macs and have few healthier options at their disposal. The goal was to serve Choi- and Patterson-caliber food at a McDonald's price point — with most items coming in at $5 or less. The goal was "revolutionary fast food." It's hard to imagine a higher-profile fast-food opening, especially when you have legends such as Tartine Bakery's Chad Robertson (who designed LocoL's long-fermented burger buns) and Rene Redzepi (chef of perennial "Best Restaurant in the World" contender Noma) listed as official "advisors." 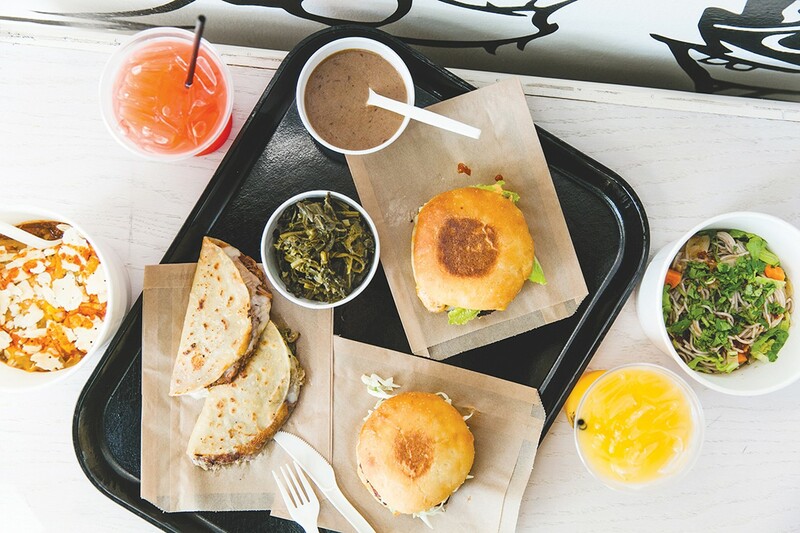 Meanwhile, Food & Wine declared LocoL's first location, in the Watts neighborhood of Los Angeles, America's best new restaurant of 2016 just one day after it opened — in mid-January, with an entire eleven months' worth of buzzy restaurant debuts to come. All of which is to say it's easy to get caught up in the narrative. The messier truth, of course, is that even in the best of circumstances, revolution tends to be more of a slog than a sprint. Less than two months in, the second branch of Locol —in Uptown Oakland, at the old Plum space — isn't perfect. The furniture — which consists of large wooden cubes that you have to push around, like in that old Sokoban video game, to form a suitable configuration — is awkward and uncomfortable. When the kitchen is busy, meals might take a very un-fast-food-like fifteen or twenty minutes to come out after ordering. And, at least for now, there is an inconsistency to the cooking, so that certain menu items vary widely in execution from visit to visit. Even with those quibbles, I found plenty to love about the place. Mainly, what I appreciate is that LocoL is very specifically a restaurant for those of us who like fast food. Even with its chef pedigree and emphasis on serving healthy eats, there isn't anything about the restaurant that feels sanctimonious. We're not talking about the kind of pseudo-fast food joint where they wrap salad inside a kale leaf and call it a burrito. Instead, the centerpiece of the menu are $5 "Burgs" that draw inspiration from the kinds of fast-food burgers that many of us grew up on and still crave, even if health considerations and Bay Area food sensibilities have taken them out of the regular rotation. The headliner is the LocoL Cheeseburg, which might take the crown for the best cheeseburger in Oakland you can buy for $5. The key to the burger is a carefully engineered patty made of 70-percent beef and 30-percent grain — a mix of quinoa, barley, and tofu, plus a bit of seaweed, which adds an earthy umami depth to the burger. True to the chefs' promise, you really can't tell that it isn't all beef, and I particularly enjoyed the salty, charred crust that formed at the edges. And the buns, which are flat like a Mexican telera roll, are worlds apart from anything you'll find at any burger chain. This is an oozy, saucy burger that you can imagine someone handing you at a backyard cookout. I liked the original Cheeseburg, which was spiked with spicy sauce and scallion relish. I loved version 2.0, which debuted about a week ago — a simpler iteration garnished with just lettuce, pickle relish, and a Thousand Island-like sauce. It's what a classic McDonald's cheeseburger aspires to be someday when it grows up. And there's an argument to be made that the other "Burgs" are even more delicious. There's a fried chicken sandwich that's made by grinding the whole bird and mixing it with fermented oats and seasonings to form what winds up being an uncommonly juicy chicken patty. Topped with slaw, it's a tasty, stripped-down version of a style of fried chicken sandwich you'll find around Oakland. (For $4, you can get a small tub of that fried chicken, in miniature "Nug" form.) 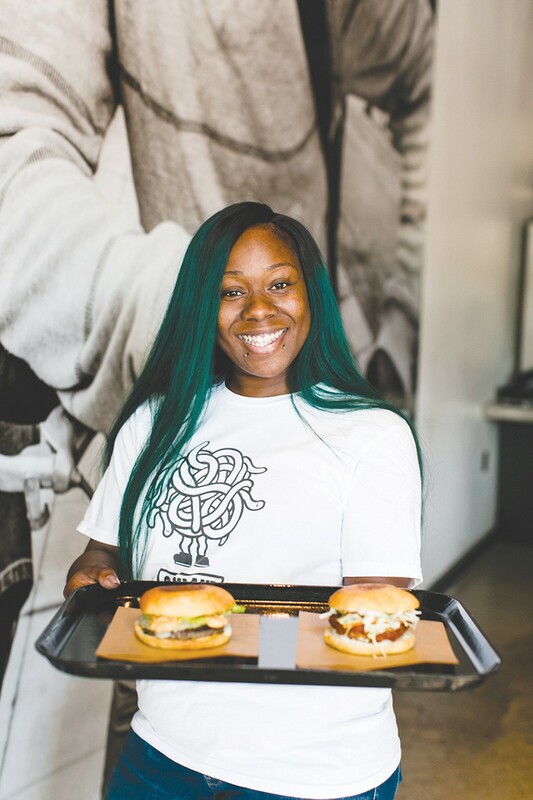 The BBQ Turkey Burg is LocoL's alternative to a pulled-pork sandwich, the key to which is the smoky, not-too-sweet barbecue sauce and the slather of buttermilk mayo, which adds an extra boost of savoriness. What's interesting to me is that, as much as LocoL draws on so many fast food touchpoints — in everything from the flavor profiles to the lively cartoon mascots decorating the walls — there are two glaring omissions: There's no soda and no fried potatoes of any kind — even though French fries, in particular, would almost certainly be a huge seller. In an email, Choi explained, "We decided to draw a certain line in the sand for what we stand for, and that line was fries and soda." Keep in mind, then, that, in the absence of any kind of combo deal, most folks probably end up spending $10 or $15 for a complete meal, even with the prices being as reasonable as they are. Fortunately, in lieu of fries, the restaurant offers a slew of other tasty side items. Similar to Choi's various Los Angeles restaurants and food trucks, the menu draws from a multitude of influences — Asia, Mexico, and the American South. There are "foldies" — a cross between a taco and a quesadilla — whose crisped-tortilla exterior has the kind of toasted-corn fragrance you'll never find at Taco Bell, and whose fillings include beans, cheese, and an assortment of braised and shredded meats: carnitas or machaca (braised, shredded beef), for instance. The beef chili bowl — rice topped with chili, shredded cheese, a jolt of hot sauce, and crumbled saltine crackers — is pure, sloppy, down-home comfort. And maybe my favorite meal to get at LocoL, if I'm not in the mood for a burger, is a trio of soul-food sides: rice, beef-and-onion gravy, and collard greens, which will run you $6 total. For breakfast, the restaurant serves a variety of "egg in the hole" sandwiches, which turn out to be just regular breakfast sandwiches, but with these odd-looking, but exceedingly tender, square blocks of egg that reminded me of Japanese tamagoyaki — some marvel of chefly engineering. The coffee, available either black or "sweet and creamy," might be the best $2 cup in town. Not everything works. LocoL has the distinction of offering more vegetarian options than almost any other fast-food chain, but the vegetarian items were, without exception, the weakest — from the overly soft noodles and bland broth in the "Noodleman" bowl, to the one-note tofu-and-veggie stew (the one note being "sour"), to the falafel-like veggie burger patty that lost its crunch and took on an unappealingly gummy texture. But look: Choi says locations in West and East Oakland are in the works. And the restaurant is putting its money where its mouth is, in terms of the people it hires: Everyone I saw on the exceedingly warm and friendly staff was a young person of color, and, according to Choi, most hail from the Deep East. Several were recruited at LocoL's job fair, which emphasized that "the only experience you need is whoever you are at this moment in life." And you know what? There are kinks to be ironed out. But those folks are doing a great job.